Your office space should reflect you - this is where most people spend 1/3 of their lives, so it should be comfortable, accommodating to your business, and clean. It should be a place that you want to walk into every morning and be productive. At the end of every day, I make sure my desk is completely clean so I will be ready for the next day. Also, I try to not clutter my desk with too many items - this uses up valuable real estate, and can lead to chaos. Make sure all of the necessary items for your business have their own place, whether you are utilizing drawers, shelves, pin boards, etc. Even though my office is small, I still make sure that all of my shipping supplies are together, all of my printing supplies are in the same location, etc. so I am not running around trying to finish projects. If you are not one to think about creating processes, there are still ways that you can make it easier for you. For example, I have streamlined my ordering process, so my wedding clients provide their initial deposit and details all at the same time. This is a process that I created to not only make it easier for me, but easier for my clients as well. I try to reduce time and emails, so I am able to handle many clients at one time and maximize profitability. Think about your business, and how you can streamline. Try to think about ways to use your website to maximize your time and build client trust. By having common items readily available, potential clients have a tendency to trust you more when you are organized about provided information. If I personally was going to hire someone for a service, I would go to their website first to a) see their portfolio and b) find out the process and pricing. As a potential client, if there was just a place that said "contact me so we can discuss your event", I probably would not book that company because they made it difficult. If the information was available, and there was a spot to contact you afterwards to book your service, then this would build trust. Try to think outside the box instead of copying others in your industry; simplify as many processes as you can, and by doing so it will reflect professionalism. I provide a service and a product, so I needed to create new ways of processing orders to maximize my time (it is just me, with no employees). If you sell products, think about how you can organize your products on shelves, using an inventory management system, a mailing station, etc. I house three large digital printers in my studio, as well as paper, envelopes, twine, samples, cutters...the list goes on, so in a small space it is important that you decide what you use the most and have this available to you. Be realistic on what you will put away every day and what is used on more of a daily basis. By keeping your workspaces as clutter free as possible, this reduces errors and stress. It seems like every time I am on social media, there is a planner discussion going on! I believe with good reason - I am one of those who uses both technology and the traditional paper/pen methods to organize myself. I have tried many planners, and I have benefits of the Day Designer, Emily Ley's Simplified Planner and ShePlans To Do List Planner below. I think that planners are a personal choice, so I suggest downloading a sample page from the website before purchasing. Emily Ley has done a fantastic job in marketing this great planner - with her beautiful, bright color branding to the accessories you can purchase with it. I purchased the weekly version, since I also use an electronic calendar to remind me of important items, I didn't need a full page for each day. Benefits: Clean design; colorful, easy to read typography; gorgeous gold accents; very light to carry. I met Ashley Staum at Paper Camp in February, and she is just the sweetest! I purchased her Weekly To Do List Planner, and she has a different layout than what you would traditionally see in a planner. Benefits: offers a vertical layout for a true to do list; maximizes space; has an additional section for weekly items so you do not have to keep rewriting on each day; thicker paper so your pen will not write through; pretty neutral accents throughout; the best cover designs. Whitney English has done a fantastic job with motivating entrepreneurs for a well-designed life, and offers many formats of planners (including one with wrap around cover). I actually purchased the daily version of this one, just because at the time I wasn't sure exactly how I would be using it. Benefits: many extra pages on mission statements, goals, passions, a strategic brand plan, etc. ; a section at the top of each page for the three biggest priorities of the day; a daily gratitude section; a section for a daily quick to do list. The online calendar system that I have just discovered is BusyCal. It is a feature-rich app that you can purchase from the App Store, and syncs wonderfully with Gmail and other calendar systems. It has a beautiful layout, and a cleaner dashboard that the traditional Gmail Calendar. I definitely need something automated that would send reminders, so having an online system that syncs and informs me of deadlines is critical for my business. I have just recently written a detailed blog post on this, but I think from a client's perspective you have to be organized with your email. I routinely have clients that tell me stories on how they contacted other vendors who never responded, or took three to four days to respond. If you do not have your out of office on, you should respond to client emails no later than 24-48 hours after receipt. Even if you do not have the answer, let them know that you haven't forgotten about them. Keeping your inbox organized with client emails, business emails, and inquiries can increase your sales because not everyone is doing it. I have benefited greatly from others who have poor communication and organization. The tips that I have for managing email help in providing trust between myself and the client before they even place an order with me. Hopefully, some of these tips will help you become more organized with your business. At least, motivated to keep your office tidy! 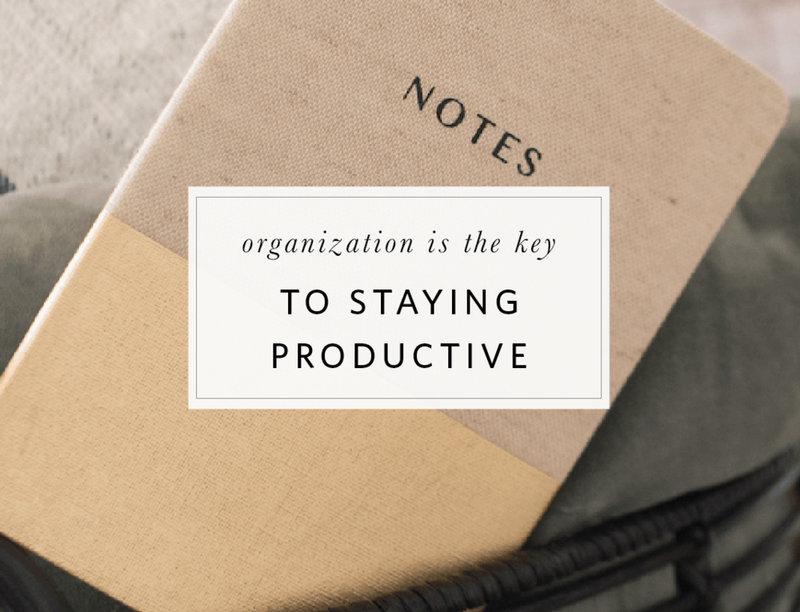 Do you have any organization tips that help you with your workload? What do you struggle with the most?